A single sequin was left at the crime scene. A pair of Ruby Slippers was stolen in Minnesota, then recovered 13 years later. The pair was brought to this museum for close examination by our Ruby Slippers experts. Matthew Shepard was a young, gay man who was killed in Laramie, Wyoming, in 1998. His murder made headlines around the world and resulted in an outpouring of grief and anger that people channeled into poetry, songs, movies, a charity foundation, a national Hate Crimes Prevention Act, and at least two plays. We were honored to collect objects from his parents and learn about Matthew. 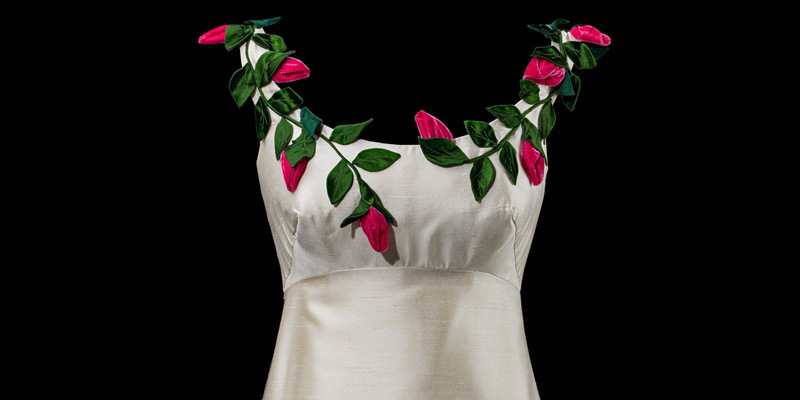 Ann Lowe designed this dress for Pauline "Polly" Carver Duxbury for her 1967 debutante ball. Erupting with flowers, the 1967 debutante gown makes you happy just looking at it. That happiness was Ann Lowe’s goal. Click on this blog post for the beautiful photos, stay for the dramatic story of a disaster that could have ruined a future First Lady’s wedding if not for Lowe's dedication to her work. Sparkly stars, white go-go boots, and white shorts. Do you know which team's cheerleading uniforms we collected? Don’t be shocked when your hist'ry book mentions me—and your money! He didn't throw away his shot, and Alexander Hamilton ended up on more American money than you may realize. 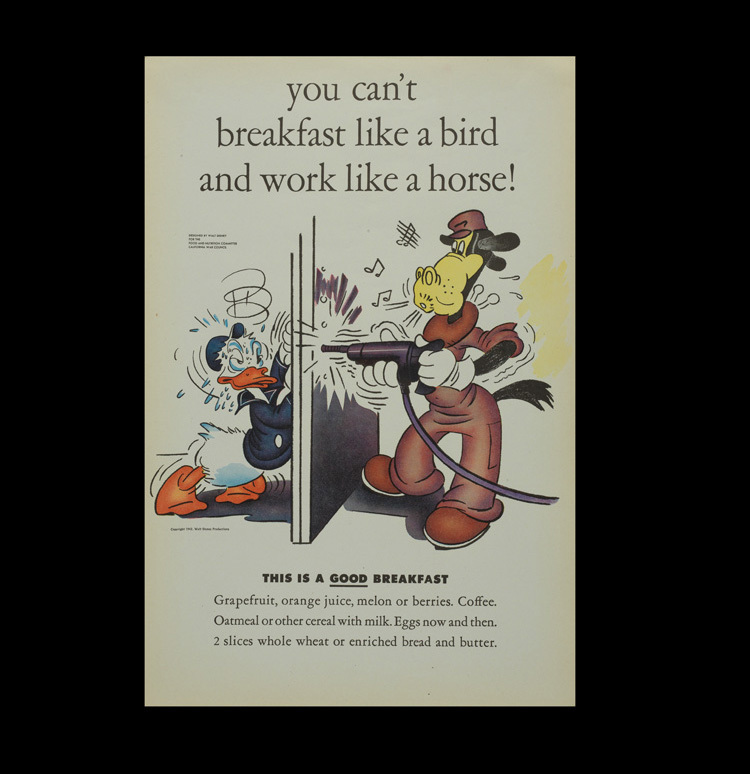 Familiar Disney characters were pressed into wartime service along with less familiar ones. Ever heard of Fifinella? Easier than memorizing lines, Alan Alda would often operate on a copy of the script so he could read his dialogue. 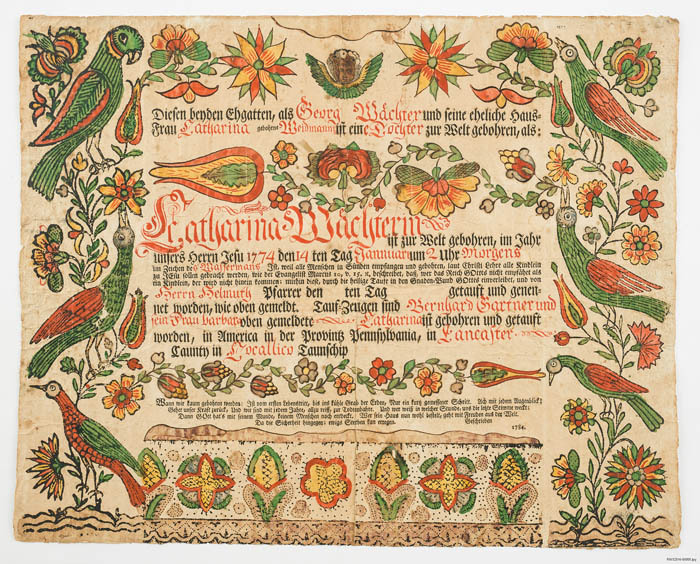 This printed and hand-drawn birth and baptismal certificate for a girl named Catharina Waechter, born January 14, 1774, was created by Heinrich Otto in Pennsylvania around 1774. German settlers brought their tradition of decorating documents with German calligraphy to America and continued it as part of maintaining their culture. What did Franklin think students of immigrant Germans should learn in classrooms in Britain’s North American colonies? Without Prohibition, would America have experienced a vibrant tradition of mid- and late-20th-century homebrewing? Probably not. If you’re in charge, you get to put your face on currency, revealing and concealing aspects of your identity. Our team that works with the National Numismatic Collection discovers LGBTQ stories on some very old coins. Erin Blasco managed the museum’s social media presence and blog. If you mustache, her toupe blog post of 2018 was about the best hair in the museum’s collection.